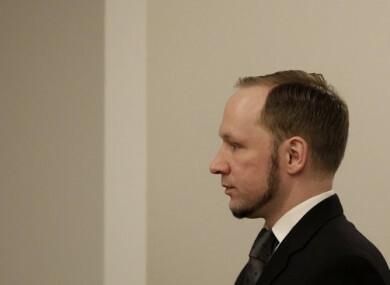 The appeals court noted that Breivik was still trying to spread his extreme rightwing ideology. NORWEGIAN MASS MURDERER Anders Behring Breivik has not been treated “inhumanely” by being held in isolation in prison, an Oslo appeals court ruled today, overturning a lower court judgement. “Breivik is not, and has not, been subjected to torture or inhuman or degrading treatment,” the court said in a statement. In a 55-page ruling, three judges found that Breivik’s five-and-a-half year isolation was justified by the danger he poses to society and the violence to which he himself may be subjected in prison. The 38-year-old right wing extremist, who killed 77 people in 2011, will file an appeal against the verdict to Norway’s Supreme Court, his lawyer Oystein Storrvik announced immediately after the ruling was published. In July 2011 Breivik, disguised as a police officer, gunned down 69 people, most of them teenagers, at a Labour Party youth camp on the island of Utoya, shortly after killing eight people in a bombing outside a government building in Oslo. Breivik said he killed his victims because they valued multiculturalism. Convicted of the bloodiest crimes in Norway since World War II, he was sentenced in August 2012 to 21 years in prison, which can be extended indefinitely. In April 2016, an Oslo district court stunned survivors and families of the victims when it found the Norwegian state guilty of treating him “inhumanely” and in “degrading” fashion in prison, in breach of Article 3 of the European Convention on Human Rights. The lower court judge had noted in particular Breivik’s lengthy isolation regime. He has been held apart from other inmates since his arrest on the day of the attacks, and his lawyers argued that has been detrimental to his mental health. The Norwegian state appealed against that ruling. In a January hearing held in the Skien prison where the neo-Nazi is incarcerated, the state argued it was compensating for the strict regime by providing him with three well-equipped cells, as well as extra interaction with guards and a prison visitor, among others. Today, the appeals court found in favour of state on all counts, also upholding the lower court’s ruling that Breivik’s right to privacy, as guaranteed by Article 8 of the Convention, had not been violated. He had argued the strict controls on his correspondence with the outside world breached his rights. Email “Norwegian mass killer Breivik loses case against his solitary confinement”. Feedback on “Norwegian mass killer Breivik loses case against his solitary confinement”.